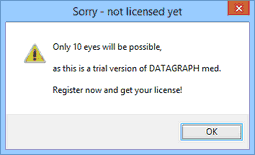 Note: Without activation, Datagraph-med will allow you to display graphs only from the original samples file or from a new file with no more than 10 eyes. To unblock this limitation you will have to order Datagraph-med and get an unique activation code. To activate Datagraph-med on your PC click on the key-icon. This button will disappear after a successful activation. 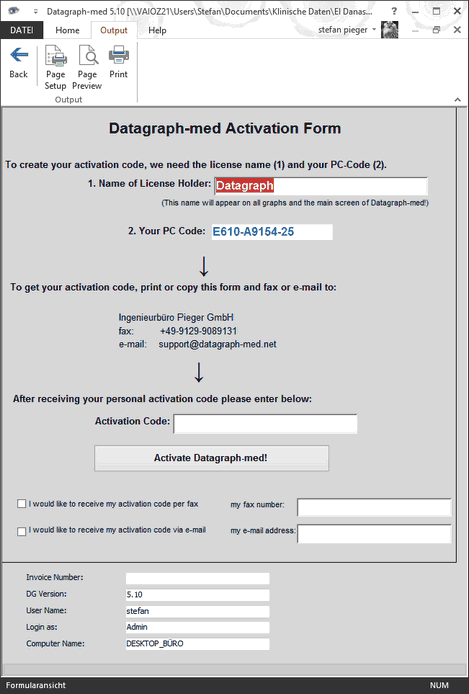 The Datagraph-med© activation code is specific to the user name and PC hardware. The unique PC code which appears on the activation form is needed to generated the activation code for every PC where you intend to use Datagraph-med. Enter your name or the name of the clinic in the field 'Name of License Holder'. This name will appear on all Graphs and the main screen of Datagraph-med. Please note that the name entered under '1. Name of License Holder' and the 'Activation Code' must be entered exactly as provided by us. The password is case sensitive. After you entered your Activation Code and clicked on 'Activate Datagraph-med!' a 'Success' message should appear. If not, verify for typing errors and repeat to enter the Password and Activation Code! Now you can use Datagraph-med without any limitation! Keep your activation code as you might have to enter it again after an re-installation process. New versions of Datagraph-med will require a new activation code however.